Does the thought of planning your company holiday party turn you into the Grinch? Yes, holiday party planning can be stressful, but it doesn’t have to be. With a few simple steps, you can organize a fantastic event that everyone will be talking about into the new year. 1. Choose a fun activity. Holiday parties are a time to celebrate the season and recognize your team for all of their accomplishments. Instead of just sharing a meal together, let loose a little and do something fun. We are partial to bowling of course, because everyone can participate and you don’t have to be good to enjoy it. 2. Choose a venue with party planners. Look for a venue with professional party planners that will oversee your event from start to finish. You will want to work with someone with great communication skills and who will handle the details. 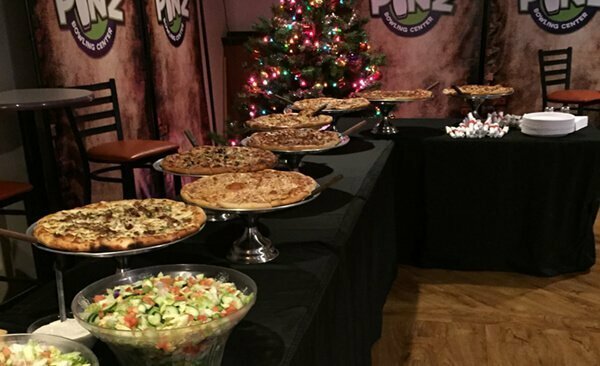 At Pinz, we’ll take care of everything so you can relax and have fun. It wouldn’t be a party without great food. We offer a variety of buffet options and also have some selections for guests with food allergies. Did you hear that we are known for our delicious pizza? 4. Get an accurate head count. Head counts do matter to ensure a smooth running event. Make sure your team members R.S.V.P. in advance and to let you know if additional guests (if allowed) will be attending. This way your venue will be able to prevent overcrowding issues and able to prepare the right amount of food. Local venues fill up quickly around the holidays so don’t procrastinate in reserving your date and time. There is nothing worse than being shut out of your perfect venue. Find out how to get started in planning a spectacular party. Hi, I was thinking about a birthday party for my son with his friends and parents (about 30 people). How do I have to make it to book within two Saturdays? Hi Steve. We’ll be happy to help you with your son’s birthday party. Please give us a call at 248-437-0700 or fill out the information request form on the birthday page of our website http://pinzsouthlyon.com/kids-birthday-parties/ and we will get it reserved for you. Thank you.